I met Custer Tiuson for the first time at the carpark of The Legend Villas. He was with his sister. After a short introduction, I immediately boarded their car, with my video cameraman. We drove along Pioneer St. in Mandaluyong. Custer, the driver, was very calm behind the wheels. His passenger behind him was not so calm; I was very excited! It was my first ride, and so far the only ride, I have taken with a driver with autism. I was producing a video show for Autism Society Philippines’ 6th National Conference in 2000, and Custer was going to be one of the panelists. Cars have always been Custer’s passion. After asking for my birthday and wedding anniversary, Custer asked for my car’s model and plate number. Since our first meeting 10 years ago, Custer has never failed to greet me on my birthdays and wedding anniversaries; he would also call me, on the dot, to remind me to register my car. During that national conference, Custer told me he has saved enough money from his “ang pao” (red envelops used by Chinese for their cash gifts) to buy his first car. Custer is now 35. His parents managed to gently convince him not to buy his own car. And except for driving the car in and out of their garage, Custer is not allowed to drive alone. His parents do have valid reasons for these precautions. The Kennedy Krieger Institute (in Baltimore, Maryland) has a national online autism research program, the Interactive Autism Network (IAN) Project (www.ianproject.org). IAN collects critical information on ASD adult experiences and needs, like driving. With permission from the Kennedy Krieger Institute, here is “Rules of the Road: Driving and ASD”, first published in November 2009. Getting behind the wheel of a car is a rite of passage for many teenagers, but for high-functioning individuals with autism spectrum disorders (ASDs) this task may prove particularly difficult. Along with the impulsivity, inexperience, and other traits of adolescence and young adulthood that can make driving a challenge, an individual with ASD may find him — or herself struggling with potential obstacles posed by autism itself. Can he or she quickly intuit and react to the “big picture” of any given driving situation? Can he or she interpret and respond to the actions, attitudes, or intentions of other drivers? Can he or she keep calm, neither overly anxious nor angry? Can he or she avoid “zoning out”? This is an important area to explore, particularly as the high number of children with ASD transition to adulthood. Related research in the area of mobility of individuals with other disabilities, or of theelderly, shows that the ability to get from place to place enhances health, improves overall quality of life, and promotes participation in the community. For some, driving will not be an option. Others may have the potential to drive, but find the prospect too overwhelming. For many, using public transportation will be taught as a life skill — a good idea whether they are planning to learn to drive or not. Transportation needs may also be addressed as part of disability services. Still, there are some individuals with ASD who can learn to drive, especially if given sufficient support. A typical adolescent is an inexperienced driver by definition, and is hampered to some extent by a brain that is not finished developing. The prefrontal cortex — the part of the brain that is home to executive function skills, such as planning, setting priorities, inhibiting impulses, and weighing the consequences of actions — is not mature when most teens get their first driver’s license. This may help explain why they are about four times more likely to be involved in a vehicle crash than a more experienced, older driver. Also, while young drivers are less likely than adults to drive after drinking alcohol, their crash risk is substantially higher when driving under the influence. When it comes to sitting in the driver’s seat for the first time, a young person with ASD faces all the same issues a typically developing adolescent does, as well as additional difficulties posed by ASD. There are definitely some aspects of driving that he or she may need special help to master. It has often been observed that individuals with ASD have a difficult time copying others’ gestures or movements. How much of this is because of impaired motor skills and how much is because of difficulty with the process of imitation is not known. In any case, clumsiness or problems with coordination have long been noted, especially in people with Asperger’s syndrome. Research also has shown that individuals on the spectrum may have trouble “chaining motor acts into a global action.” In other words, people with ASD can find it hard to plan all the steps to carry out an action from A to Z all at once. Instead, they may do this in smaller, less global steps. Taking all of the above into account, we may speculate that individuals with ASD will need some extra help learning the skills necessary to drive. There is not yet research on what techniques are ideal, but it is likely that breaking down driving skills into component parts and allowing more time than the typical beginner might need to master them will be required. Studies show that one of the biggest strengths for many with ASD is attention to detail. What is more of a challenge is grasping the gist of a situation. To use a common metaphor, they may see each and every tree in the forest without clearly perceiving the forest as a whole. An ability to see “the forest” is important to quick and accurate decision making in tasks such as driving. For example, an individual driving a car over a winding road while approaching a bridge, in the pouring rain as the silhouette of a pedestrian emerges up ahead, may be required to sort through the relevant details. Darkness, a winding roadway, a bridge where water tends to freeze first, the pedestrian’s body language (is he about to step out onto the road?) — these are details needed to be considered in order to arrive at a decision to proceed more slowly than the posted speed limit. Individuals with ASD can have a hard time reading the body language of other people: expressions, gestures, stances. Traffic has its own body language. A car with a confused elderly driver at the wheel may move slowly and drift over the yellow line, while a car driven by someone intoxicated may move at a high rate of speed or careen before the driver regains control. A tailgating car may indicate impatience in the driver, an overall aggressive attitude, or simply a lack of courtesy. Experienced drivers can pick up on the anger, upset, aggressiveness, or confusion of other drivers. They usually can recognize when a car is about to turn or change lanes, even when the driver doesn’t use a turn signal. Recognizing these and other subtle traffic behaviors becomes second nature, and plays a key role in how expert drivers respond during emergencies. How do novice drivers become expert drivers? Can these skills be broken down and taught to an individual with ASD, much as they might be taught about human body language or personal space? Researchers are beginning to explore these and related questions. Additional concerns often raised as a family thinks about whether their child with ASD is ready to drive are emotional regulation and the ability to focus. Some individuals with ASD can be irritable, anxious, or have meltdowns. Some individuals have difficulty maintaining attention. Quite a few have been diagnosed with anxiety, attention deficit, or other issues in addition to their ASD, while others suffer from seizures. Any of these issues may impact the ability to drive. Furthermore, it is clear that some individuals may be taking medications that could interfere with that ability. Although these issues and their relation to driving aptitude have not yet been addressed by researchers, they are clearly important to consider. If a person with ASD cannot keep his focus on the road, or stay calm enough to drive responsibly, he may not be ready for this rite of passage. On the other hand, if he is able to stay calm and focused, whether thanks to treatment or simply growing maturity, driving may be a real possibility. People with ASD may have one extraordinary strength when it comes to driving: They are often sticklers for rules and regulations, and may obey traffic laws better than typical drivers. What may be more of a problem is coping with the transgressions of neuro-typical people far more comfortable with bending or breaking the rules. Much of today’s research focuses on early interventions that will be critical for the future of infants and young children with ASD, but research that addresses critical life skills in adolescence and adulthood also is needed. There are vast numbers of young people growing up to join the already large number of adults with ASD. Researchers are beginning to address issues faced by adults with ASD, including how to help them learn to drive. For example, Children’s Hospital of Philadelphia is currently conducting a study on the “learning to drive” experience of teens with ASDs. The researchers hope to learn enough to develop guidelines to help families decide whether their child is ready to drive, as well as educational tools to support families of teens or young adults with ASDs during the learning-to-drive process. Hopefully, future teens with ASD and their families will have much more information and many more resources available as they approach this and other important milestones on the path to adulthood. Meanwhile, my friend — Custer, the driver — has now his own line of baked goodies for sale, labelled Custer, the Baker. Driving or baking, Custer is happy. ASP Dream Girls (Thara Marie Santiago,Velle Baria and Nika Escasinas, all teenagers with autism) will perform during the Women with Disability Day at the SkyDome of SM North EDSA on March 25, 2010 in celebration of the Women’s Month. 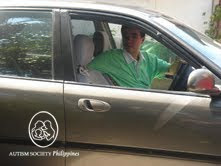 Visit www.autismsocietyph.org.